Point TV is back in business this semester. We are continuing all of your favorite shows and adding a few new twists to them. We may be short staffed but we do not intend to let that get in our way. This semester we will be using our 12 student team to take on many of our classic projects. 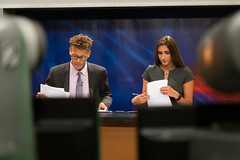 You will see our weekly news show, Coastline News combined with Loma Sports Tonight, the show where we talk major sports lingo. Acoustic Showcase will also be making its return featuring some of Point Loma Nazarene’s most talented musicians. Reel Students is back in action talking about some of the best projects we produced in the past. Your weekly school announcements all in one minute is back in business on Heynouncements. Get to know your favorite professors on Spill the Beans while also experiencing some of San Diego’s coolest coffee shops. Learn some fun and quirky facts about your fellow students on our vogue inspired 27 Questions. To top it all off we will also have a 60-second short film. 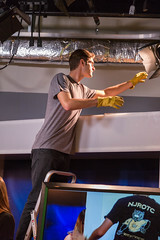 Dakota Campagna, Senior Media Communication major, is the new producer of Loma Sports Tonight, Point TV’s weekly show about everything sports related. When asked about how his leadership will impact LST, Campagna responds by making sure he is the perfect role model for others. “I expect to have a great six shows this semester for LST, while also having fun with it”. “The only major change really happening this semester is that we have decided to combine Coastline and LST together into one show. 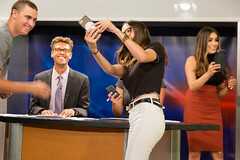 The show itself will be called Coastline, and start off with the news broadcast, but will then have a longer sports segment towards the end of the show that will cover not only PLNU and local San Diego sports news, but also national sports news”. Said Campagna. Dakota Campagna is not the only new leader we have on the team this semester. Brianna De Melo, Senior Media Communication major, is coming in hot as the producer of Spill the Beans and 27 Questions. “I hope to do the past episodes of each project justice by continuing with their style but adding my own aspect of creatively”. Said DeMelo when asked about how she will approach leadership. “There will only be one episode of each project but the ones we do will not disappoint our viewers.” Said DeMelo with confidence in her ability to execute these shows.